It is important for B2B companies to understand the unique habits of their customer base so that they can refine their marketing strategies accordingly. Luckily, a new study from ExactTarget and Pardot is shedding light on the subject. 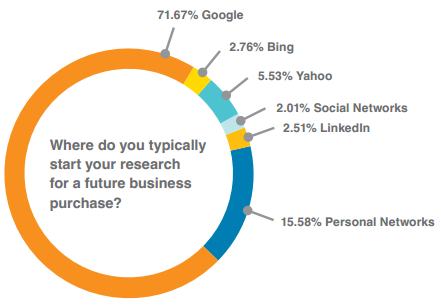 The State of Demand Generation study surveyed 400 B2B buyers about their purchasing preferences, and found that nearly 72 percent of B2B consumer research begins on Google, while 16 percent starts with a consumer’s own personal network. And although we all know how significant SEO is when marketing your brand (regardless if it is B2B or B2C), it is important to note the influence of word-of-mouth. In fact, the data suggests that inspiring customers to share positive brand experiences with their friends should be among a B2B’s top marketing initiatives. The study also reveals insights on the product research habits of B2B buyers. After initial product research on Google, the data shows that 70 percent of customers conduct research two to three more times before seeking manager approval for a purchase, while only 18 percent conduct all of their research in one sitting. In addition, 89 percent of respondents said that price influences the amount of research that is conducted before a purchase is made, and 98 percent claim that as their research deepens, their search terms usually become more refined. It is also important to note that B2B companies should be offering a lot of diverse content, because 76 percent of respondents claim that they prefer different types of content at each stage of their research process. That said, this content shouldn’t be too long, as the study found that 70 percent of consumers prefer content to be under five pages. Stage One: This content should be broad and help readers understand a problem. Try to limit the promotional nature of this content, and make sure that it provides value to the audience. It is a good idea to determine the keywords that prospects use when they start their research, and produce content for those terms. Some examples of good stage one content include blog posts, industry articles and infographics. Stage Two: This content should nurture customers. A good way to do this is to show social proof of your product or service’s value, because user-generated content is always influential. Examples of ideal stage two content include video testimonials, analyst reports, webinars or ROI calculators. Stage Three: Stage three content should prove that your company is the right choice, because these prospects are almost ready to make a decision. Use this stage to promote your brand and identify your product or service’s strengths. Content examples include buyer guides, sample RFPs and competitor comparison documents.